So in order to compute e.g. the square root of some number x where there is a function sqrt for then you will have to use sqrt(x), whereas "square_root(x)" won't of course work. 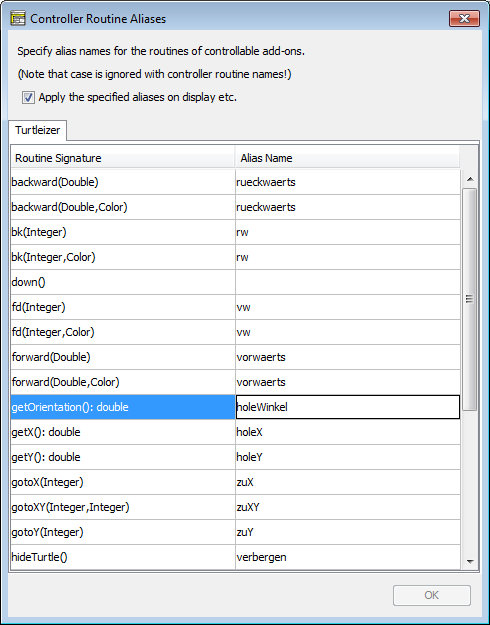 With some plugged-in demo controller modules like Turtleizer, this is now (i.e. since version 3.27-05) different: Teachers requested a possibility to "translate" (more generally: to rename) the available turtle commands in order to facilitate the learning process of their pupils, such that e.g. users in Spain might type "adelante" instead of "forward" in order to move the turtle ahead. But these alias names should not automatically change with the chosen dialog language. So a separate preferences mechanism was needed. You may use the same alias name for routines with different argument number, though, but not for routines with equal argument numbers. An empty cell in the right column means "no alias" for the routine of that row. So by clearing a cell you can delete a specified or conflicting alias. If you leave the dialog with <Esc> or by pressing the close button ([x]) then all your changes will be discarded (forgotten). In order to make the alias definitions effective you must select the checkbox "Apply the specified aliases on display etc." above the tab region in the Diagram Controller Aliases dialog (see screenshot farther above). In syntax highlighting mode, the alias names will be underlined for easier distinction. In the element editor you may type either the original or the alias name without making a difference: The diagram will constantly show the alias, and when you edit a respective element, you will find the alias in the editor text area. Internally, however, the original routine names are still stored in the diagram, such that execution, code export etc. are not affected, i.e. they work as before. This way, you will even see loaded diagrams with your set of aliases if they have been created without any alias or with different set of aliases.